Yes, I love my husband and he’s great and all. However, he’s not a big fan of Valentine’s Day. He’s one of those V-Day haters who say, “That’s not a real holiday.” Of course, I beg to differ. My pups on the other hand LOVE to celebrate every day and every moment, especially if it involves goodies for them. They are so much fun to do something with and for on Valentine’s Day. Dogs are so easy please that anything from homemade biscuits to an extra-long walk will make them happy. Because all kinds of dog products cross my desk, I thought it would be fun to gather those that are Valentine’s Day and/or heart themed for you or your pup, in case you want to go for that extra something-something. Orbee-Tuff Nooks by Planet Dog. Boredom busting with heart! My dog Tampa Bay loves his little red nook with a heart-shaped hole, perfect for stuffing in his favorite treats. It’s a great enrichment toy, plus it’s easy to clean (which I love). These bouncy, buoyant and durable balls are minty, too. Available with other colors and hole shapes, too: the green peace sign, a yellow smiley face, a royal blue star and a red star, a green shamrock and a lime green paw. Retails for $13.95; planetdog.com. Planet Dog’s Holiday Love Ball. 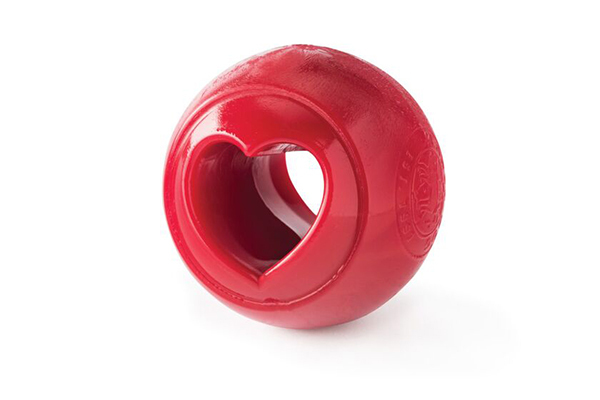 Planet Dog has a second item on my list and this one just screams Valentine’s Day, especially for the ball-loving dog. 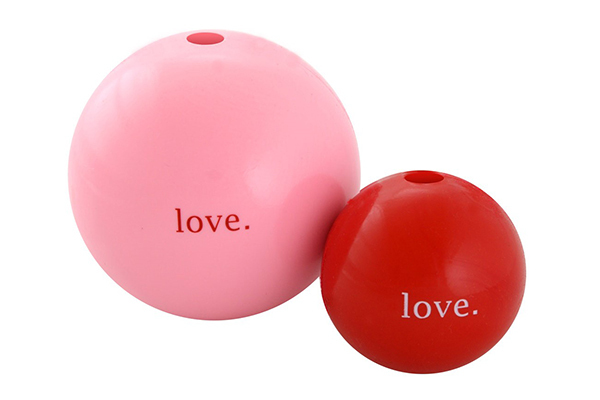 He’ll have lots of fun playing with the pink or red Love Ball, made of the Orbee-Tuff material that’s bouncy, chewy, buoyant and durable. Comes in two sizes: 2 ½ inches and 4 inches. Retail from $13.95 to $17.95; planetdog.com. Blue Dog Bakery’s Love Bites. Just in time for Valentine’s Day, Blue Dog Bakery has come out with its grilled chicken and cheese-flavored Love Bites treats. My dogs totally dig the Blue Dog Bakery treats, particularly the Gingerbread flavor that came out during the holidays. 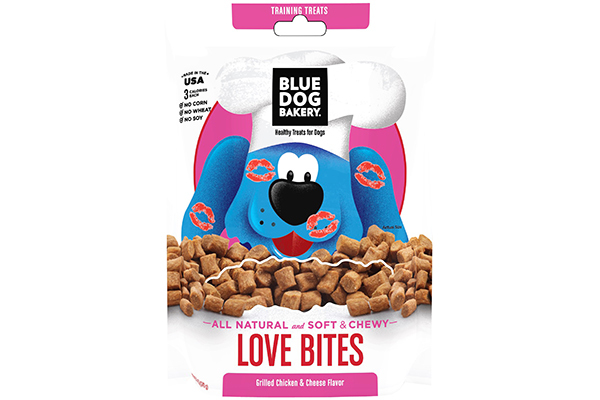 What’s so great about these soft and chewy Love Bites is that they are only 3 calories per treat. There also made with human-grade ingredients but without corn, soy, wheat and no artificial colors or preservatives. You can find them at PetSmart, retailing for $4.99; bluedogbakery.com. The Sweeter Vest by BossPup. 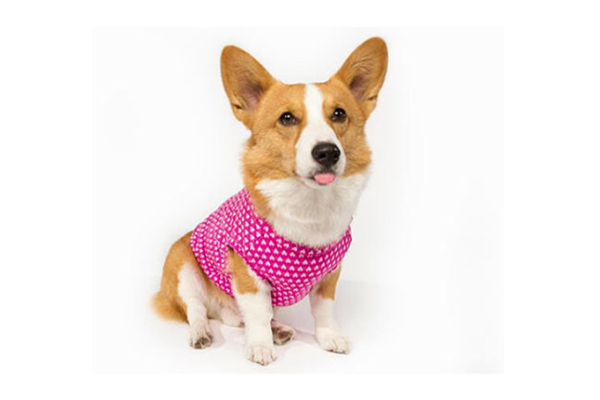 LA-based BossPup just recently came across my radar with its stylish clothes for dogs. I heart the Sweeter Vest, and think it makes the perfect pup outfit for Valentine’s Day. It comes in black hearts, which would look sharp on my two boys, and also in pink hearts. Comes in Large (20 to 25 pounds) and XL (25 to 30 pounds). Retails for $30; bosspup.com. 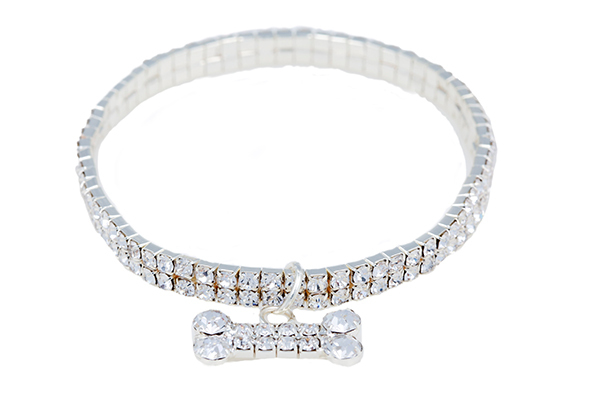 Rhinestone Bling Necklace Dog Collar by Canine Styles. If you believe the only proper way to celebrate Valentine’s Day is with something that sparkles, you’ll love this beauty! Really, it speaks for itself! Comes in sizes 10 (6.5 to 9 inches neck size) through 14 (9.5 to 13 inches neck size). Retails for $25; caninestyles.com. 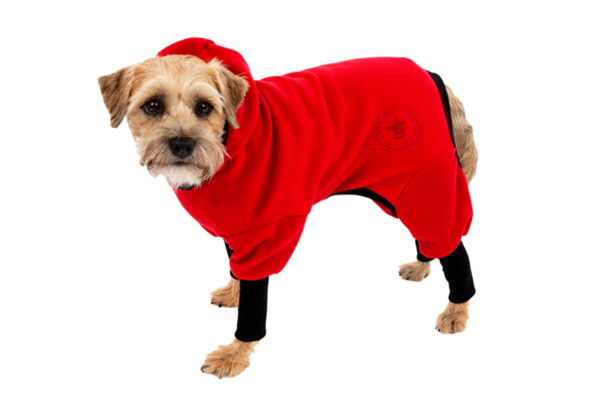 Canine Styles’ Polar Fleece Track Suit. This sweet and snuggly item is guaranteed to keep your furry one toasty warm during the cold month of February and the rest of winter (especially if it’s a long one). It’s the Valentine’s Day gift that keeps on giving back to your pup. 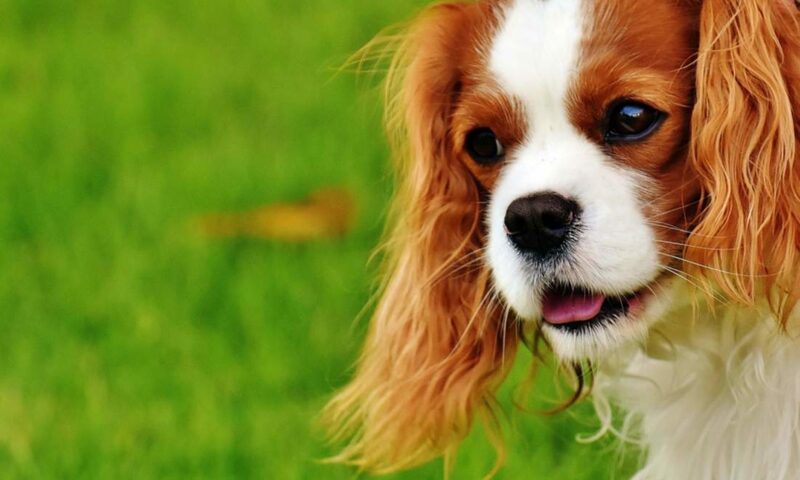 Light pink and cranberry are two of my all-time favorite colors, and both are guaranteed to look great on your dog, plus give off that sweet-on-you vibe. A little too sweet for you? I’ll let you in on a secret — it also comes in navy and in brown. Available in sizes 8 (up to 4 pounds) through 18 (23-28 pounds). Retails for $50; caninestyles.com. 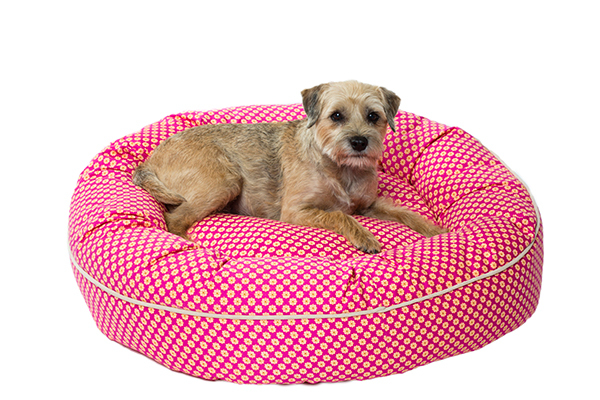 The Pink Follard Pattern Nesting Bed from Canine Styles. I don’t know about your dog, but my two pups have five dog beds and they use them all, plus my own bed. But I think I need to move them on up to this ever-so-fine nesting bed that not only will they love but also it will look great in my home office. Comes in two sizes: 24 inches (for up to 16 pounds) and 32 inches (up to 45 pounds). Retails for $225; caninestyles.com. Tattooed Mom handmade wool sweater by Chilly Dog. Honestly, I love this sweater. 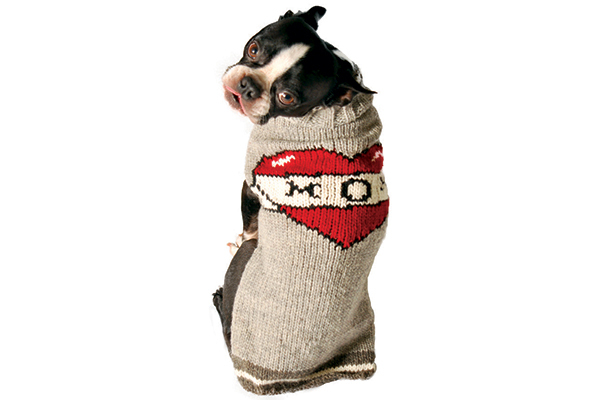 It’s got that retro tattoo look, plus shows the world how much your dog loves you and keeps him warm at the same time. Available in sizes XXS to XXXL. Retails for $29.99; chillydogsweaters.com. Hearts and Flowers & All Hearts collars from Up Country. I change my dogs’ collars at least twice a year, if not more. They’re both boys, so a collar is a simple way to bling them up. 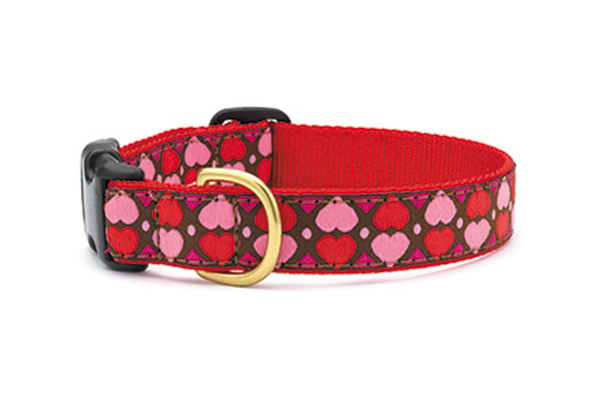 These tender heart collars have great patterns for boys and girls, showing that your dog is both stylish and loved. Both collars come in: wide (1 inch) or narrow (5/8 inch). The Hearts and Flowers collar also comes in teacup (1/2 inch). You can also get harnesses, key rings and leads in these patterns, plus there is a sweater in the Hearts and Flowers pattern. Retails from $12 to $23; upcountryinc.com. Everyone recognizes the Russell Stover box of candies. It’s practically synonymous with Valentine’s Day. 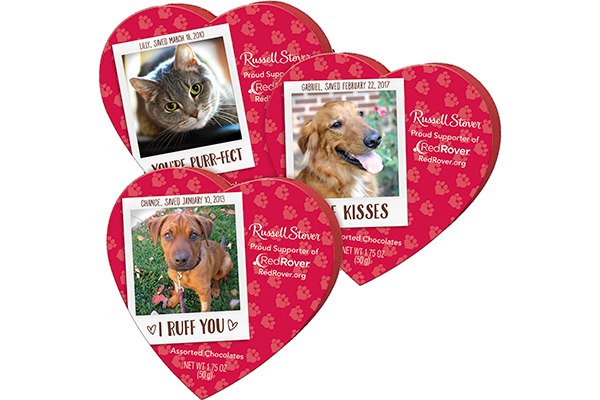 This year, Russell Stover selected the nonprofit organization Red Rover, which helps pets in crisis, providing emergency sheltering, disaster relief services, financial assistance and education, to feature on limited-edition chocolate bars and signature heart-boxed chocolates. Candy bars retail for $1.49 and can be found at Wakefern stores. You can buy the 1.75-ounce hearts for $1.29 at AAFES, Rite Aid, Target, Publix, HEB, Hy-Vee, Savemart, Big Y, Food City, Dierbergs, Giant Eagle and Woodmans. Go for the bigger chocolate heart at 3.5 ounces for $2.99 at Kroger, Albertsons, Savemart, Woodmans, Giant Eagle, Hy-Vee, Wakefern, HEB and Bilo. On top of that, Russell Stover will donate $50k to Red Rover, allowing Red Rover to not only help animals in crisis but also support its mission to strengthen the human-animal bond. Red Rover created a Paws4Love contest to promote the human-animal bond. To enter, create a video that shows how much you love your animal friend. There will be prizes, which include lots of chocolate (for humans, not dogs, of course!) and other great items. The contest runs through 2 p.m. PST on February 14th. The Ugly Pugline, Wilson the Pug in Love. For those of you who enjoy a great love story for Valentine’s Day, we’ve actually found a dog-themed one for you. 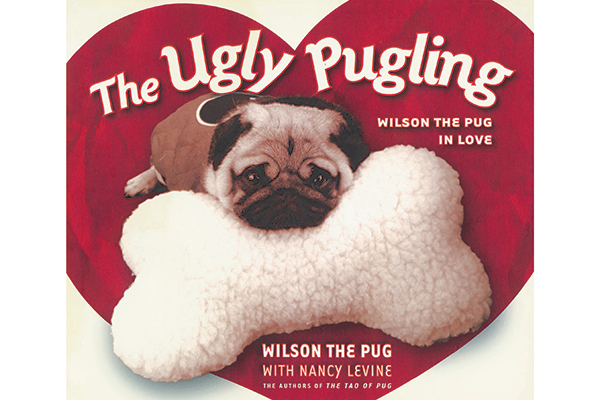 Check out The Ugly Pugline, Wilson the Pug in Love by Wilson the Pug with Nancy Levine, published in January 2018 by Skyhorse Publishing. When Wilson falls in love with Hedy, a Mastiff puppy, challenges and comedy await! This book reminds us all that when it comes to love, it’s what inside that really counts. Retails for $14.99 and available at Amazon, Barnes & Noble and indieboundo.org. Tell us: What Valentine’s Day dog products do you love? What are you gifting your dog or the dog lover in your life this V-Day? Stay tuned for more from Executive Editor Melissa L. Kauffman on Dogster.com’s Dug Up at Dogster column and on social media with #DugUpatDogster. The post Dug Up at Dogster: 11 Sweet Valentine’s Day Dog Products for Your Beloved Pup (and You!) appeared first on Dogster.